I will probably read it at some point although I don't think I'm going to rush out and buy it. The cover sure is pretty though! Agreed Amy - I'm in!! 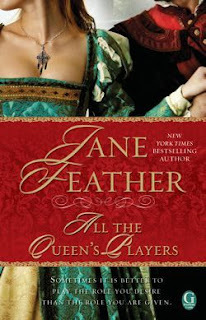 I find this time period endlessly fascinating and I've enjoyed a number of Jane Feather's historical romances, so I'm definitely in! On an unrelated note, how are you liking Highest Stakes? I'm quite curious about this book. Just Wish List-ed it on Amazon. Sounds amazing! Your blog looks fantastic on my new monitor, and now I can actually see that there is a texture on the background. Funny how it never showed on the old monitor. Sounds a bit interesting but I probably won't run out for it. The cover sure is pretty! I enjoy Jane Feather's books. It should be interesting seeing this world and its events through Rosamund's eyes.